Tennis Net with metallic frame - Super Light (3.5 p )for Extreme Portability. Designed for children with adjustable Net Height which adapts to younger or older children - Super fast to set up and to fold. Product color: Pink - dimensions (Length) 5FT x (Height) 28 inches x (Width) 28 inches. (150cm x 71cm x 71cm) Strong and Durable Nylon adjustable side sleeves - Comes with a carrying bag in nylon. Recommended Balls to be used with this size court: Le Petit Tennis inflatable or Le Petit Tennis Foam "low bounce" balls. Both balls will allow an immediate rallying back and forth for hours of fun. 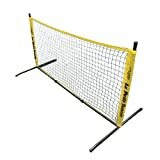 NEW SIZE - 5-foot (1.50 meter) Tennis Net with metallic frame - Super Light (3.5 pds) for Extreme Portability. Designed for children with adjustable Net Height which adapts to younger or older children - Super fast to set up and to fold. Strong and Durable Nylon adjustable side sleeves - Comes with a carrying bag in nylon.